What criteria are used to include TP53 mutations in the UMD TP53 database? Publications with a high error rates (incorrect correspondence between codon and amino acids or erroneous coordinates) have also been omitted. ii) Published and unpublished data from two sequencing projects (ICGC and TCGA) have also been included. The current version of the UMD database uses the stable NCBI sequence NG_017013.2 as a reference for TP53 as well as hg18 (NCBI Build 36.1), hg19 (GRCH37) or hg38 (GRCh38) genome builds. This is a key issue as it will alleviate any problems associated with the use of multiple genome references by the various NGS pipelines. The joint effort resulted in a recently released stable TP53 reference sequence, LRG_321 containing the genomic sequence from human genome build GRCh37.p13 (ftp://ftp.ebi.ac.uk/pub/databases/lrgex/LRG_321.xml). We believe that its annotation with precise labels and coordinates of 8 different TP53 transcripts (t1 to t8) and 12 isoforms (p1 and p3 to p13) will be preferred to the RefSeq identifier pairs provided by the NCBI for genome build GRCh37.p13. Therefore, we have used LRG transcript and protein isoform numbers in the database. • We may have failed to detect your publication: please send us a reprint and we will include your data. • Your data may have already been reported in another publication. Please check the entire list of publications for other publications from your group. In the case of duplicate data, we usually include the older publication. • The nomenclature used in the manuscript to describe the mutations may have been too ambiguous. If you like, send us a full description of the mutations using the official nomenclature and we will include your data.(http://www.hgvs.org/mutnomen/). You can use mutalyzer (https://mutalyzer.nl/) to check the accuracy of your mutations. • There may have been too many erroneous mutations in your manuscript. Publications with more than 20% of errors (codon/amino acids/events) were discarded. If you like, send us a full description of the mutations using the official nomenclature and we will include your data. Some of these mutations may already have been published. Please check the entire list of publications. If this is a mistake, let us know and we will update the database. Check the description of these mutations, as they may have been too ambiguous to be included in the database. The official nomenclature for the description of sequence variants is described by the Human Genome Variation Society (HGVS) (http://www.hgvs.org/mutnomen/). All mutations included in the UMD TP53 database have been carefully analysed and manually reviewed with mutalyzer (https://mutalyzer.nl/), a powerful tool developed by Jeroen F.J. Laros in close collaboration with HGVS. We have noticed that numerous insertions and deletions were not accurately described (see some examples below). All these mutations have been carefully curated and modified to comply with the official nomenclature. 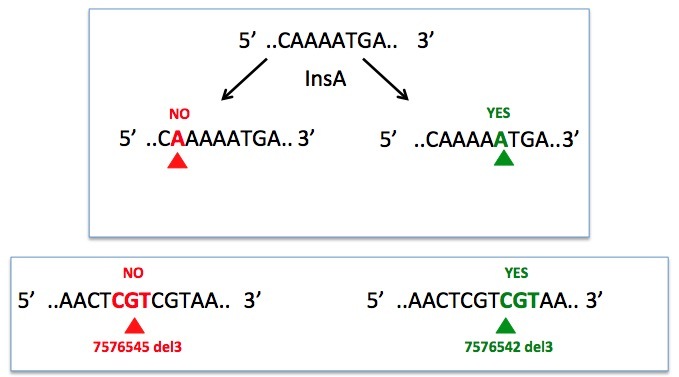 Many insertions described in the literature are in fact nucleotide duplications. This has also been correted in the database. The UMD TP53 database only records the diversity of mutational events targeting the TP53 gene. The variant MN_000546.5:c.1010G>A (NP_000537.3:p.R337H) is founder mutation that occurred in only one individual (or perhaps a few individuals) and has been transmitted to the entire population of descendents in Brazil. Therefore, only a single genetic event occurred in the population leading to dissemination of the mutation. Defining this mutation as a hot spot mutation because it has been found in several hundred families is not correct. Similarly, identical mutations found in matched primary tumours/metastases or preneoplastic lesions/primary tumours have been entered into the database only once, using the earliest lesion for disease category. Although the mutations have been very carefully entered into the database, a few errors may have been made. Please contact us in order to correct the database. Send us a full description of the mutations using the official nomenclature and we will include your data. Please contact us and we can discuss this issue, which could be of particular interest to improve curation of the database. Some articles are notoriously erroneous and describe only artefactual data. Why are they still in the database? We have developed a curation procedure based on various types of statistical analysis of the database. Each publication has been assigned with an outlier index ranging from 0.1 to 15 with a cut-off of 2 (see for more info). Any value greater than 2 suggests that the publication should be considered to be suspicious and should be interpreted cautiously. 136 publications with an index ranging from 2 to have been identified and labelled as outliers. The few publications known to include a majority of sequencing artefacts have an index ranging between 5 and 12. These publications have been kept in the database to provide the scientific community with access to an uncurated database with the possibility of developing and improving curation algorithms. What are the most common problems associated with TP53 mutations? Artefactual mutations from DNA extracted from paraffin-embedded tissue. Duplicated series of TP53 mutations published in different journals. I have used your database for my work. How should I cite the database? Please use the latest publication and include the url of the website. This is an important issue, particularly if it is a germline variant. If it is a frameshift variant (germline or somatic). If the mutational event has been verified*, finding a novel deletion or insertion is not infrequent and the mutation could be considered to be pathogenic. Germline variant* Peripheral blood lymphocytes Sequencing a larger number of individuals may allow identification of excessively rare, novel, non-pathogenic SNP. Until the pathogenicity of the variant has been clearly demonstrated (segregation with the disease or experimental analysis), this variant should be considered to be a Variant of Unknown Significance. Various tools can be used to predict the pathogenicity of the mutation, but their sensitivity and specificity for TP53 are low. Use with caution. The effect on RNA translation or splicing is not included in predictive software. You can contact us for further discussion concerning this variant. Somatic variants*, ** Frozen tissues In the absence of any functional information, there is no way to define whether this variant is a driver or a passenger mutation. Somatic variants*, ** Paraffin-embedded tissues Sequencing of DNA from paraffin-embedded tissues is known to be associated with a high number of artefactual single-nucleotide changes (C:G>T:A). Careful control is necessary to validate this variant. In the absence of any functional information, there is no way to define whether this variant is a driver or a passenger mutation. * Assuming that sequencing of the genetic material has been carefully performed and controlled. ** It is assumed that the somatic origin of this variant has been validated by sequencing normal DNA from the same individual.